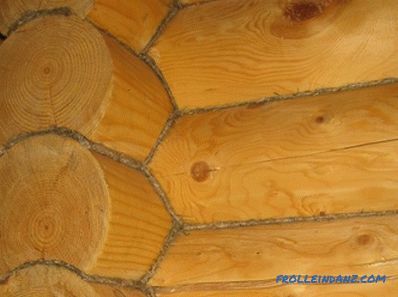 Round logs are a modern material for building houses in the ancient way. What qualities has a rounded log, its pros and cons, as well as the advantages and disadvantages of a house from it - the topic of this article. A rounded log is made of straight tree trunks. Their machining on a cylinder machine looks like a lathe groove of a cylindrical part. The workpiece is fixed with two ends and is driven into rotation around the longitudinal axis. The cutting tool moves along the barrel, cutting off the excess, and giving it a cylinder shape. 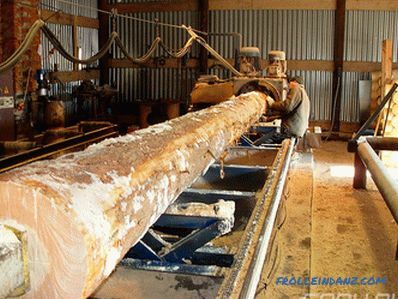 In order for the treated log to retain its shape, it is first dried to atmospheric humidity. 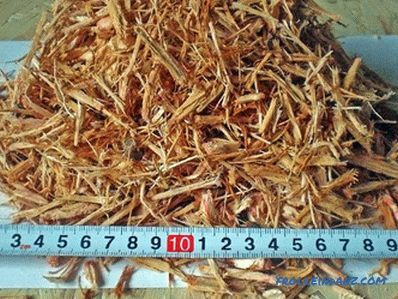 On the log processed in this way, a longitudinal lunar groove is made, which is necessary for tight coupling of the crown logs, and compensatory (unloading) cutting. Propyl is a groove 5-7 mm wide and 20-25 mm deep. It somewhat reduces the internal stresses in the wood that occur during drying, and reduces cracking. If cracks do appear, it is not on the lateral surfaces of the log, but go out into the groove, which allows preserving the flawless appearance of the walls from the outside and inside. Instead of a moon groove, grooves of a more complex shape, including those with double-sided log profiling, can be cut from above and below. But in any case, the visible sides remain intact. 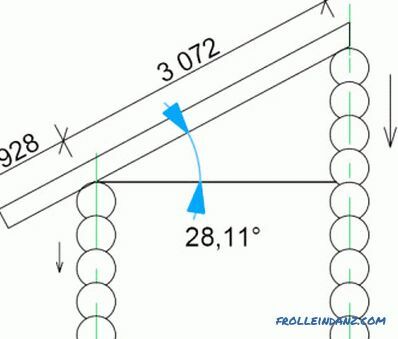 The unloading cut can be done at the same time as the mounting groove or just before sending the parts to the construction site, and in some cases it is not done at all. 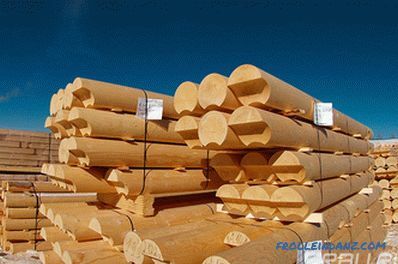 It depends on the quality of the wood, the diameter and length of the log. When rounding off, the trunks are given one of the diameters of the standard size range: from 220 to 320 mm, with a step of 20 mm. After completion of the mechanical treatment, the wood is impregnated with antiseptic and flame retardants. The construction technique of a rounded log is different from the traditional procedure. Modern woodworking equipment with detailed design allows you to pre-cut logs into parts of the desired length and make all the cuts necessary to assemble a log house. With this approach, ready-made parts are delivered to the construction site, which do not require additional processing and fitting. The crowns are stacked and sealed like Lego cubes. It remains only to install pins and mezhventsovye screed. This greatly accelerates the construction and improves its quality. The advantages and disadvantages of a rounded log house are a continuation of the advantages and disadvantages of the source material. Everything becomes clear by comparison, so we will compare a rounded log with other materials. This was described in detail in the previous section. 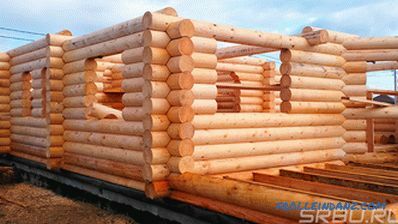 The speed and accuracy of the assembly, the quality of the walls rounded log significantly surpasses other materials. Exact processing of parts on special equipment in the factory slightly increases the cost of the material, but provides significant savings due to ease of assembly of the log house and ease of ensuring its quality. Work on trimming logs, cutting locks, fitting, etc., is no longer done at the construction site. Only the laying of finished parts, the laying of sealer, the drilling of vertical holes, and the installation of dowels. The amount of handwork is minimized. Saving time is saving money on the wages of builders. Despite the fact that the logs are subjected to high-tech processing, the degree of this processing is small, so the cost of building material does not increase much from the cost of the original wood. For example, profiled or glued timber are more expensive. Savings are achieved not only due to the very nature of the material, but also due to the high construction speed and minimal labor costs. Wood has a low thermal conductivity compared to brick and other wall materials. Due to this, a log wall with a thickness of only 200-300 mm has the same heat transfer resistance as a brick wall half a meter thick and even more. The average thickness of a log wall is higher than that of a log-like one, since a bar is cut by cropping off a log. On the other hand, precise machining of parts and their tight coupling reliably protect the joints from blowing. All this gives a warm wall, well protected from the cold. A round log house has basic qualities inherent in any log house. This is a relatively small weight and durable design, the strength of which is given by the mutual connection of all parts. Unlike a brick structure, a log cabin can only be completely destroyed.He resists to the last any destructive loads, while maintaining its integrity. The smooth surfaces of the logs, their clear geometric shape, make complex finishing work both inside and outside unnecessary. It is enough to cover the walls with protective varnish. In some cases, additional caulking cracks are required. From the inside, a decorative caulker can be made of a twisted cord or the seals of the joints with a special sealant. 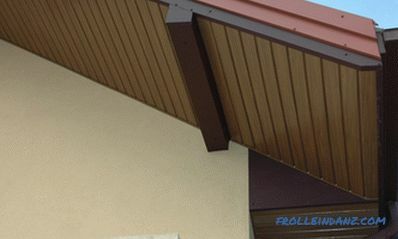 coating with protective and decorative varnish. Quite a bit of hassle, isn't it? The low weight of the log house allows you to ease the foundation, reduce its consumption of materials and the complexity of its construction. 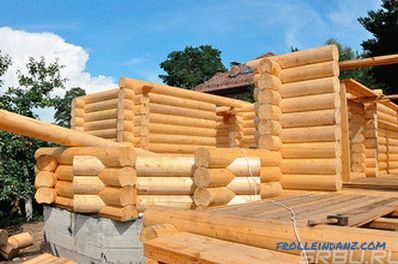 For the log is well suited columnar or pile foundation. 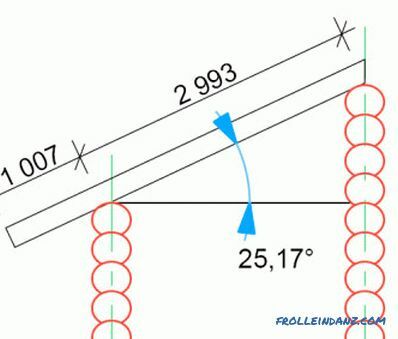 The lower rims rest on the foundation not along the entire length, but at several points, but at the expense of their rigidity they themselves perform the functions of grillages. As a result, fewer materials are spent on the foundation, and less time and labor is required for its construction. Wood is a natural material and does not contain toxic substances. However, in the production, the log is treated with antiseptics. And although this reduces its environmental cleanliness, still the oiled log remains the leader in this indicator. The walls of the house of the logs breathe, making the house a favorable macroclimate. The house from the rounded ancient possesses good aesthetics, the two-piece is pleasant to the touch and smell. 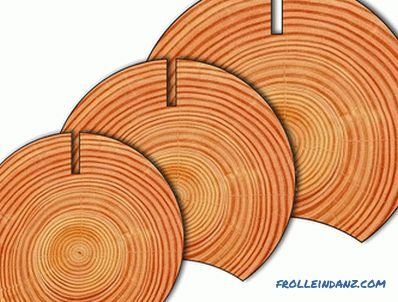 The main disadvantages of a rounded log as a building material coincide with the main disadvantages of wood. 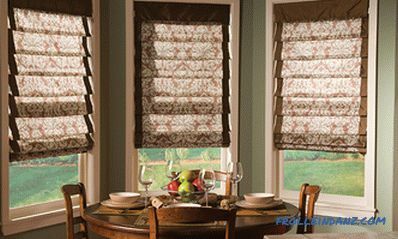 This is susceptibility to rotting and flammability, as well as a tendency to warping and cracking. These shortcomings are largely eliminated by special measures - antiseptic, impregnation with flame retardants, the device of the discharge groove, fixing the crowns with dowels and screw or spring ties. After building a house, it takes time to shrink the log house. During this time, the crowns more closely fit into place, the humidity in them evens out and comes to balance with the humidity of the air. 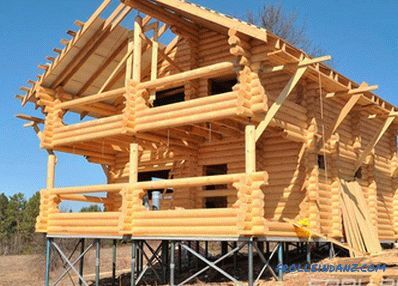 As a rule, the height of the log house at the same time decreases by 3-10% depending on the initial and final humidity, the accuracy of the preparation of logs and accuracy of assembly. Shrinkage, postpones the timing of the introduction of the house in operation. After shrinkage, the dimensions of the log house continue to fluctuate slightly following seasonal changes in humidity. 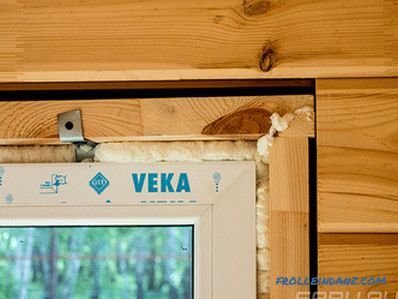 Therefore, window and door frames, as well as some other structures mounted in the house, are mounted on sliding fastenings - casing, which do not prevent the vertical displacement of the crowns, but do not allow the occurrence of cracks or unanticipated loads. The lower rims of the house are most damaged, as they are most in contact with moisture. To combat this disease there is a large number of anti-filamentous antifungal impregnations. In order to prevent the destruction of the house, it is necessary to inspect his condition in time and take the necessary actions to protect. An ized log is a plant material and is susceptible to insects. The methods of struggle are the same as in the last paragraph - this is the use of insecticidal action of impregnation. 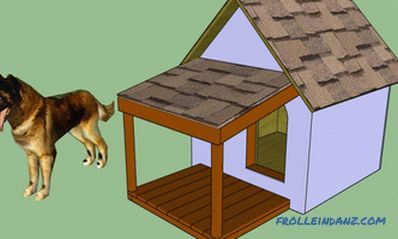 The conductivity of a rounded log house is higher than that of a stone house. Especially this point should be taken into account if it is planned to build a house on busy roads. The wood beam burns very well, just like any other wood material. To restore the house after the fire is not possible. 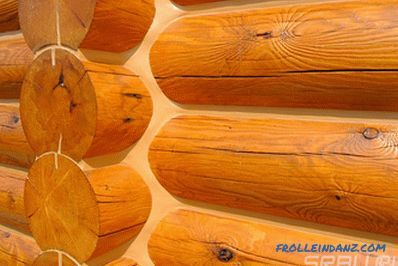 If you want to keep the color of a log house, you will not be able to warm the walls. At the same time, the available thickness of a log house may not be sufficient for comfortable year-round living. It all depends on the region in which the construction is planned. Therefore, before you decide on materials for construction, at home, be sure to find out the recommended standard wall thickness of wood for your region. The features of a log house can also be regarded as weaknesses - the pronounced relief of the walls and the need to release the ends of the logs beyond the corner locks. But the assessment of these features depends on the personal views of the homeowner.Often logs are given preference precisely for the traditional color of a chopped house. Every virtue, and every flaw, may have a different value in the eyes of the developer, depending on the specific circumstances and personal preferences. Someone likes chopping, flat corners and flat walls. 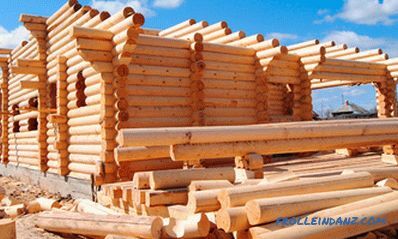 For some, the traditional type of log log house with protruding logs is valuable. Someone is important to save, and someone is ready to overpay, just to realize their vision of the perfect home. We weigh all the pros and cons, and decide on the choice of material and type of house.